For more than a decade, our firm has called on every PBM to identify all rebates (and other monies) the PBM is receiving from manufacturers – as well as the “net costs” of every drug – to enable Plans and their beneficiaries to easily identify and favor the lowest-cost drugs in each therapeutic category. While we’ve had success in getting a small number of PBMs to provide most of the above information to our clients, no PBM has been willing to adopt a new business model and disclose all such information to all clients. Meanwhile, drug prices have continued to soar. Now, ironically, thanks to Mylan’s exponential EpiPen price increases, PBMs are in the cross-hairs trying to explain their own rebate and pricing practices. While Mylan’s Chart depicted 4 different channel vendors obtaining equal amounts, industry experts made clear that PBMs are the players extracting virtually all monies from manufacturers. Soon, other evidence surfaced connecting PBMs’ rebate practices to manufacturers’ price increases. For two examples, read this Wall Street Journal article and this Washington Post article describing diabetes and rheumatoid arthritis drug price increases. Thus, manufacturers have inserted a new narrative about industry dynamics into the marketplace, namely: PBMs’ rebate practices may “bend the cost curve” for their clients, but their practices also cause manufacturers to increase their list prices for the entire marketplace. Below we provide a Primer to help all Plans understand PBM-manufacturer rebate relationships. We then provide short-term and long-term strategies for Plans to adopt to address rebate issues. Finally, we describe PBMs’ responses to manufacturers’ attacks, which make clear that since PBMs are unlikely to change their practices, Plans must address PBMs’ rebate tactics or suffer the consequences. We warn you in advance that our discussion is lengthy. So grab a cup of hot chocolate, sink yourself into a very comfortable chair, and set aside 15 minutes to do a deep dive into this complex world. Given the $100 “net cost” in both scenarios, one might superficially conclude that PBMs and their clients might not care which approach is pursued. However, there are at least five reasons why PBMs prefer the rebate approach. And all five reasons pose dangers for your Plan. 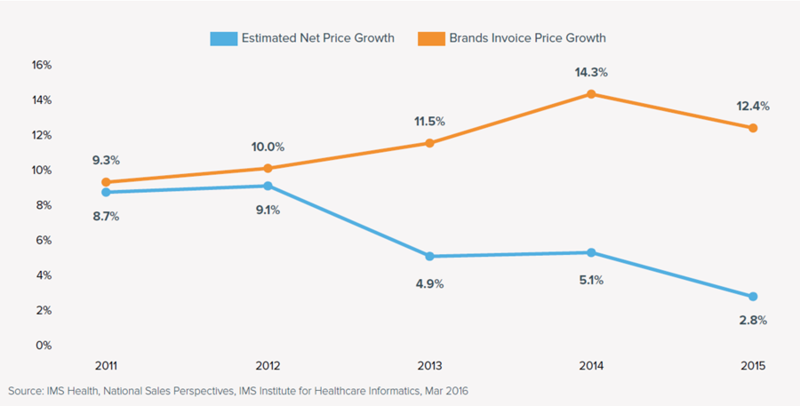 PBMs Use Rebates To “Bend The Cost Curve” For Their Clients: PBMs – and their clients – know that many, if not most, brand manufacturers’ list prices have continually increased for many years. To address their clients’ ever-increasing costs, PBMs use rebates to reduce drugs’ list prices and “bend the cost curve” for their clients. But note that up until recently, if PBMs demanded greater rebates, manufacturers could raise their list prices as much as they wanted to maintain their profit margins, and do so without fear the marketplace would react. Therefore, the two-step dance that manufacturers and PBMs repeatedly conducted – of manufacturers increasing their list prices, and PBMs demanding rebates – did not result in clients “staying even”. Note that until PBMs and manufacturers alter their existing two-step dance, Plans need to ensure they receive rebates. Otherwise, Plans will be subjected to manufacturers’ price increases without benefiting from any PBM rebate reductions. Note, too, that to the extent that generic alternatives exist with lower “net costs,” Plans will be better off escaping the manufacturer-PBM two-step dance that’s impacting many brand drugs, and relying on generic drugs instead. PBMs Need To Retain Existing Clients & Win New Clients: Every year, a certain number of Plans decide to try to improve their prescription coverage programs, either by conducting one-on-one negotiations with their existing PBMs or by conducting a PBM RFP. PBMs know that manufacturers with the highest-cost drugs in a therapeutic category are in a position to agree to the largest rebates. However, PBMs also understand that those manufacturers’ larger rebates may not result in as low a “net cost” for clients as other brand drugs with smaller rebates, or as generic drugs with no rebates at all. But PBMs also know that Plans – and their consulting firms – rarely evaluate whether any PBM’s rebates will result in the dispensing of drugs with higher “net costs”. As a result, PBMs “chase rebates” on the highest-cost drugs in order to retain and win clients, even though doing so will likely result in higher aggregate drug costs for Plans and their beneficiaries. Clearly, Plans – and their consulting firms – must evaluate PBMs’ Formulary structures and underlying rebate arrangements, assess the net costs of each drug in each therapeutic category, and insist on customizing their own Formularies. Until Plans do, Plans’ costs will be higher than they would otherwise be, and PBMs will have no reason to stop “chasing rebates”. PBMs Benefit From A “Rebate Re-Labeling Game”: When PBMs negotiate with manufacturers, PBMs are positioned to label the financial benefits the manufacturers provide to PBMs with any labels PBMs choose – “rebates” or any other name (administrative fees, purchase money discounts, health management fees, data sales fees, etc.). Manufacturers don’t care which label is used. After all, for manufacturers, the money they pay to PBMs will be the same regardless of the label. But PBMs know that their contracts with clients typically only require that PBMs pass through “rebates” to their clients. Therefore, to the extent PBMs use labels other than “rebates” in their manufacturer contracts, PBMs can increase their own revenues and profits. Clearly, this represents another conflict of interest: If PBMs acted solely and exclusively in their clients’ interests, PBMs would label all monies as “rebates”. But PBMs have their own interests, and the lack of transparency over their manufacturer contracts enables PBMs to retain monies for their own accounts. Suppose a manufacturer’s list price for a drug is $200. Suppose 10,000 scripts of the drug will be dispensed to a Plan, resulting in total sales of $2,000,000. Now suppose a PBM has executed a contract with a manufacturer that calls for the manufacturer to pay a 3% rebate (that will be passed through to the Plan) and a 3% administrative fee (that the PBM will keep). What is the result for the PBM and the Plan? What happens when the manufacturer increases its list price by 10%, to $220, and total sales are now $2,200,000? Note that manufacturers could insist that all financial benefits they pay to PBMs are labeled as “rebates” and passed through to PBM clients. But thus far, manufacturers haven’t done so. Nor are they likely to do so in the future, notwithstanding their recent attacks on PBMs. After all, PBMs are the ultimate arbiters of Formulary inclusion and placement, as well as Prior Authorization/Step Therapy Program favoritism. Therefore, if manufacturers want to maintain and increase their drug sales, manufacturers have no choice but to accede to PBMs’ contracting requests. However, PBM clients (like your Plan) can alter the impact of PBMs’ “Rebate Re-Labeling Games”: All you need do is insist that your PBM contract requires that all third party monies – regardless of label – are passed through to your Plan. Note that there are PBMs in the marketplace that will provide such contracts. We know, because we have obtained such contracts for our clients. Moreover, if more Plans demand such contracts, more PBMs will be forced to provide them. Unfortunately, as of now, few Plans do, meaning PBMs’ “Rebate Re-Labeling Games” continue essentially unimpaired, benefiting PBMs but not their clients. PBMs Benefit From Clients’ Inertia: PBMs know that their contracts with their clients remain in place for long periods of time. In fact, almost all PBM-client contracts have the following characteristics: (i) they are 3 year contracts; (ii) clients can’t terminate the contracts without “cause” or “material breach”; and (iii) year after year, the contracts will be automatically extended for an additional year, unless clients provide notice of termination several months before the end of the contract. PBMs also know that their long-term contracts with clients typically contain “rebate guarantees” that remain static for the life of the contract, or contain very small incremental rebate increases year-to-year. Thus, as PBMs negotiate ever-increasing rebates with manufacturers each year, PBMs place themselves in the enviable position of collecting ever more rebates, without having to pass through the increased amounts to most of their book of business which continues to rely on old, essentially “stale” contracts. PBMs Benefit From Market Segmenting: Finally, PBM clients fall into multiple different categories. At one extreme: Plans that are very knowledgeable and aggressively try to control their costs, including by addressing rebate issues and continuously updating rebate guarantees. At the other extreme: Plans that lack knowledge and are essentially exercising no control whatsoever over their costs. And of course there are Plans that fall somewhere in between those two extremes. For example, some Plans have strong contracts with 4 different “rebate guarantees” – for retail, retail 90, mail and specialty drugs – and each guarantee is aggressive. For specialty drugs, those Plans are likely to have “specialty drug rebate guarantees” of $250 (or more) for every brand specialty drug dispensed. But other Plans have no rebate guarantees at all – or weak rebate guarantees for only retail and mail drugs. Clearly, PBMs can earn larger rebate profits from all clients with weak contracts. And until such Plans improve their contracts, they will continue to miss savings opportunities and enrich their PBMs instead. Given that most Plans are locked into their existing PBM contracts for one to three more years, Plan administrators need to focus on steps (i) to pressure their PBMs to act differently in their ongoing and future negotiations with manufacturers, and (ii) to reduce Plan costs until the Plans can change their PBM contracts. To pressure your PBM, every Plan administrator should respond to the recent news about price increases in EpiPens and diabetes and rheumatoid arthritis drugs to contact your PBM and ask for the following core information about each relevant drug: (i) your Plan’s average invoiced cost for the drug (factoring in your contract’s AWP discount); (ii) all rebates and other price reductions your PBM is passing through to your Plan on the relevant drug; (iii) the resulting “net cost” for each drug; and (iv) all other price reductions that your PBM is receiving for the relevant drug that your PBM is not passing through to your Plan. We’d urge your Plan to also ask for the same information about other drugs, starting with hepatitis C drugs. After all, if Steve Miller can claim that Express Scripts negotiated “a significant discount” on its preferred hepatitis C drug – and other PBMs can make similar claims – shouldn’t you as a client have the right to know how much your PBM is passing through in hepatitis C rebates? Shouldn’t you also know if your PBM is receiving financial benefits with other labels that your PBM is not passing through to your Plan? Please note: Since your PBM contract probably doesn’t entitle you to any of the above information, it’s reasonably certain your information request will be stone-walled by your PBM. But we still urge you to make the request, because PBMs need to hear that their clients are anything-but-comfortable with current practices. Turning to short-term actions that you can take to lower your costs: Given the two-step dance that exists for many brand drugs, all Plan administrators should examine their claims data and exclude at least some of the high-cost brand drugs that have multiple lower-cost generics available as substitutes. For example, if you watch any TV at all, you’ve probably seen numerous Pristiq ads that are undoubtedly increasing your Plan beneficiaries’ Pristiq use. Pristiq is likely costing your Plan about $280 (or more) per 30 day script, whereas numerous alternative generic antidepressants are available for as little as $4 to $20 per 30 day script. If your PBM (and Pristiq’s manufacturer, Pfizer) are unwilling to disclose the rebates that your Plan may – or may not – be receiving for Pristiq, you should respond by dropping your coverage for Pristiq and only covering far-lower-cost generic alternatives instead. You should also stop covering brand drugs that have lost their patents and now have chemically identical, lower-cost generic substitutes. Most brand manufacturers stop paying rebates shortly after brand drugs lose their patents. Therefore, it’s very unlikely you’re receiving any rebates from such brands that will reduce your “net costs” below the costs of the generic substitutes. Start by excluding two commonly used, high-cost drugs that recently lost their patents – Abilify and Crestor – for the reasons described in our previous articles. Then double back and look at other drugs that have lost their patents during the past few years. Please note: If your PBM contract allows you to create a Mandatory Generic Program, you can consider implementing that strategy rather than entirely excluding drugs. Doing so will allow your Plan beneficiaries to continue using high-cost brand drugs, but require them to pay the difference between the brand and generic drugs’ costs, meaning your Plan will “cap” its exposure at the generic drugs’ costs. Bottom line: If your PBM refuses to disclose the “net costs” of brand drugs with multiple therapeutically similar or chemically identical substitutes available, you should not – and cannot – assume that your PBMs’ rebate activities are satisfactorily reducing the “net costs” of the brand drugs. Instead, you should take steps to increase your plan beneficiaries’ use of generic alternatives. For all Plans with contracts that terminate in the coming year (on June 30th, September 30th, or December 31st, 2017), it’s time to rev up your engines and make plans either to conduct a PBM RFP or to join a Coalition that already has an effective PBM contract in place. Plans with PBM contracts that terminate thereafter will have to bide their time before they can act. No matter how large your Plan is, don’t expect to obtain these results in one-on-one negotiations with your PBM. Without the leverage of a RFP where your PBM is threatened with losing your business, your PBM is unlikely to accede to your requests. After you obtain a far better contract, you need to ensure that your Plan – or your Coalition – takes advantage of the contract terms you’ve put in place. What does this mean? Start by implementing a customized Formulary and customized Prior Authorization and Step Therapy Programs. Use your access to “net cost” information to do so. Whatever you do, do not rely on your PBM’s “standard” Formulary and Programs. Then review the drugs in therapeutic categories on an ongoing basis, and exclude expensive “net cost” brand drugs when multiple lower-cost generics become available. Also, as soon as brand drugs lose their patents, exclude them and only cover the chemically identical generic drugs that enter the market. Finally, take advantage of your ability to renegotiate your Rebate Guarantees – at least on an annual basis – and thereby ensure that you are keeping up with marketplace changes and continually improving your rebates. If you’re not sure all the above activities are really necessary, we urge you to read further and take notice of the two largest PBMs’ responses to manufacturers’ recent attacks. Their responses may create the energy you need to act! Tellingly, Express Scripts did not claim “to love” transparency for rebates and other labeled money Express Scripts receives. Instead, CMO Miller provided a bizarre explanation for why Express Scripts won’t provide this information. According to Miller, doing so would enable Express Scripts’ competitors to know the prices that Express Scripts is obtaining, and that would prevent Express Scripts from decreasing costs for its clients. An odd claim, if ever there was one. After all, in every other industry, price transparency and competition force vendors to reduce their prices or lose market share. 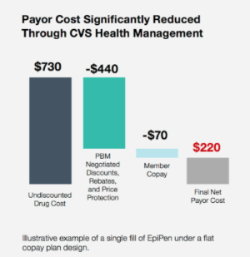 But for some reason, according to Express Scripts (and other PBMs), PBMs can only (purportedly) reduce prices by eliminating transparency and pricing competition and thus ensuring there is no pricing mechanism whatsoever in the marketplace. Turning to Caremark, it responded to manufacturers’ new attacks by issuing a White Paper about EpiPens and by purportedly describing Caremark’s rebate and pricing practices in greater detail. According to Caremark, the rebates that Caremark collects “are essentially a type of discount that is by and large passed on to clients.” (emphases added). Notably, Caremark didn’t explain its use of the word “essentially” or quantify its phrase “by and large”. Nor did Caremark even mention, let alone quantify, the other labeled money that Caremark is receiving. But note the sleight of hand embedded in Caremark’s statement: Caremark compared Mylan’s three year increase to Caremark’s annual increase! Obviously, Caremark should state both figures over the same three year period. Had Caremark done so, it would have been forced to acknowledge that Caremark’s 10% annual increase, compounded, results in a 33%+ increase in Caremark’s clients’ cost growth over a three year period. Far more important, Caremark’s assertion fails to address how much Mylan’s prices would have increased, but for Caremark’s extraction of rebates and other monies from Mylan over time. Therefore, it’s reasonable to ask where the causation lies: Were manufacturers exponentially increasing their list prices, and PBMs simply responding to manufacturers’ actions? Or were PBMs demanding ever larger rebates and other monies, and manufacturers simply responding by exponentially increasing their prices? Or were both contributing to the problem, in a two-step dance that benefited both? Note another obvious conclusion from the IMS analysis: Despite PBMs’ ever increasing rebates, manufacturers’ “net prices” still increased every year, without exception. That’s true even in the final year depicted, where manufacturers’ “net prices” still increased 2.8%. Stated differently, in not a single year have PBMs’ actions resulted in a reduction in manufacturers’ prices. PBMs would refuse to arrange secret “deals” with manufacturers. Instead, PBMs would require each manufacturer to name its “net price” for every drug. PBMs would then publish that price for all to see, and make all their Formulary and Program decisions based on manufacturers’ disclosed “net prices”. Clearly, for all therapeutic categories with alternative treatments available, PBMs’ actions would force higher-cost manufacturers to compete by lowering their prices. Otherwise, the manufacturers would lose market share. As higher-cost manufacturers acted to undercut lower-cost manufacturers, the latter would have to reduce their prices as well. So what would be the impact of PBMs’ changed approach? PBMs would create a real marketplace, where price competition would actually reduce prices. Prices would even decline for many specialty drugs, including those in the three most costly therapeutic categories (hep C, MS and rheumatoid arthritis). There is little – or no – evidence that any particular treatment is better than any other treatment within those categories. Therefore, if PBMs required the relevant manufacturers to disclose their net prices, manufacturers would have to compete on price or lose market share. Unfortunately, as you undoubtedly know, the fantasy we described is unlikely to occur. Just read the responses of Express Scripts and Caremark, and you’ll know that no such changes are in store. Accordingly, you can’t sit around and wait for your PBM to change the marketplace. Instead, if you want to decrease and control your Plan’s costs, you’ll have to act to change your own situation. And the sooner you do, the sooner you’ll reduce your costs. Hope you enjoyed your cup of hot chocolate! (i) It is possible to speculate about answers to at least some of the identified questions by thinking through the numbers that are typically reflected in clients’ contracts and claims data. The above analysis poses an obvious question: Even assuming Caremark’s “illustrative depiction” is based on reality, is your Plan actually receiving “rebates and other price reductions” worth $315 to $331 for every pack of EpiPens? There’s good reason to doubt it is, given the problems that are identified in this article as “Client Inertia” and “Market Segmenting”. © 2014. NPCC and Pharmacy Benefit Consultants. All Rights Reserved. The National Prescription Coverage Coalition was founded by the leadership of Pharmacy Benefit Consultants, a nationwide prescription coverage consulting firm that works with individual Health Plans to help them achieve dramatically lower prescription coverage costs.